The Human Rights Council chamber in Geneva. Disregard for human rights is a “disease,” United Nations Secretary-General António Guterres today told the opening session of the UN Human Rights Council, urging Member States to uphold the rights of all people in the face of rising populism and extremism. Having lived under the dictatorship of Portugal's António de Oliveira Salazar, Mr. Guterres explained that he was 24 before he knew democracy. Denying his compatriots their human rights had oppressed and impoverished many of them, resulting in a mass exodus, and also brought bloody civil wars to Portugal's former colonies in Africa. Calling today's world “more dangerous, less predictable, more chaotic,” the Secretary-General called for making prevention a priority, tackling root causes of conflict and reacting early and more effectively to human rights violations. He highlighted the importance of the Universal Declaration of Human Rights and the treaties that derive from it, and urged the Council to be “fully engaged” on the issues that require their attention. “We are increasingly seeing the perverse phenomenon of populism and extremism feeding off each other in a frenzy of growing racism, xenophobia, anti-Semitism, anti-Muslim hatred and other forms of intolerance,” Mr. Guterres said. “Minorities, indigenous communities and others face discriminations and abuse across the world,” he added, noting abuse targeting refugees and migrants, and people who are lesbian, gay, bisexual, trans and/or intersex (LGBTI). 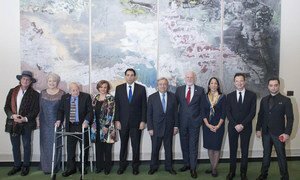 Among other issues raised, Mr. Guterres also called for protection of the human rights defenders and of journalists who are “essential” to the checks and balances of any society. In his address, UN High Commissioner Zeid denounced “reckless political profiteers” who threaten the multilateral system or intend to withdraw from parts of it. “We have much to lose, so much to protect,” the UN High Commissioner said. Speaking directly to the political actors, Mr. Zeid said “the sirens of historical experience ought to ring clear” and pledged that “we will not sit idly by” in the face of violations. “Our rights, the rights of others, the very future of our planet cannot, must not be thrown aside by these reckless political profiteers,” he added. For his part, the President of the 71st Session of the UN General Assembly, Peter Thomson, called for greater dialogue and cooperation for peace among Governments, the UN system, civil society and the private sector. He lauded the Human Rights Council as “essential” to bridging divides, and called for advancing “with common purpose” towards sustainable peace. “Just as the 2030 Sustainable Development Agenda recognizes human rights as a cornerstone for sustainable development, so too does the concept of sustaining peace,” stated Mr. Thompson, urging the Council members to put forward their best ideas, well-honed skills and most determined will to defend the place of human rights in the drive to implement sustainable development and sustaining peace in today's challenging times. Decrying the anti-Semitism that led to the Holocaust, the international community today remembered millions of people who suffered in the genocide and honoured the survivors who continue to educate future generations about the ills that hatred and discrimination can bring.